My mornings go usually go one of two ways. If it's a weekday I get up between 5:45 and 6:00, then I shower, get ready, grab my coffee to go and am out the door for work. If it's a weekend I'm up and getting coffee immediately, then hoping back in bed to enjoy said coffee in the comfort of my bed. Either way coffee is involved. Actually, now that I think about it, coffee has been part of my daily routine for as long as I can remember. I love the routine of drinking coffee in the morning, no matter where am I or what I'm doing. 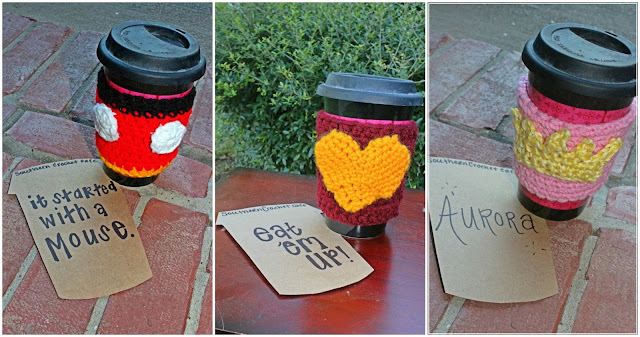 So since I have this love of coffee and because I've been looking for ways to make my coffee drinking experiences more I was so excited when my friend Stephanie asked me if I wanted a few of her adorable coffee cozies. Meet Steph! She and I go way back. We first met at Texas State University as Campus Representatives for the Disney College Program. We both are proud Texas State alumni and both worked in Guest Relations for Disney after graduation! Stephanie is the owner and creator of the Southern Crochet Cafe. 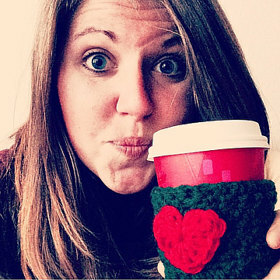 She started her very own Etsy shop, as a little side business making crocheted coffee cozies in 2014. And boy are they cute! 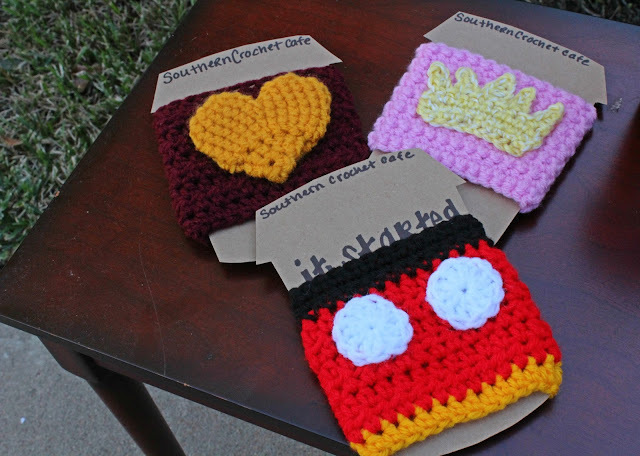 She specialized in Disney themed cozies, because of her passion for all things Disney. But she is also able to make custom cozies. My cozies are Sleeping Beauty because Aurora is my favorite Disney Princess, Mickey Mouse because hello Mickey is the best, and Texas State because Go Bobcats! I absolutely LOVED the way Steph packaged the cozies. Each one comes on it's own little cardboard cut out and has personalized touch for each cozie. Thankfully I have the perfect mug to show off my cozies! And I'm on the hunt for a to-go coffee mug that doesn't have a handle so I can take these little babies to work with me! The Mickey cozie came to work with me the other day and I got so many compliments on it! These cozies would make great gifts. Especially with Christmas right around the corner. And the best part is Stephanie is offering 20% off to all my readers! All you have to do is visit her Etsy site here: Southern Crochet Cafe and type in the code Places20 when you checkout. 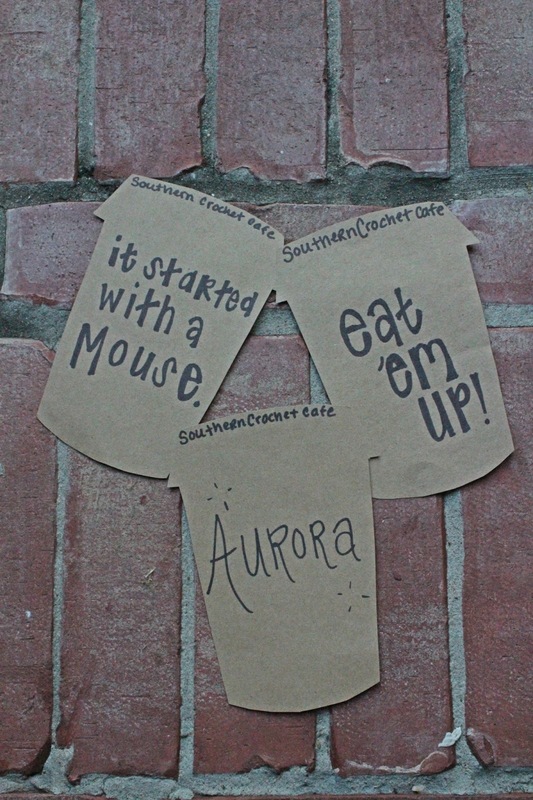 She has also offered to giveaway 1 coffee cozie to two Places I Will Go readers! Enter below! Giveaway ends on the 10th! These are so cute! They'd be the perfect stocking stuffer for a coffee lover! These are seriously so cute! I have a friend that used to work at Disney too and she's obsessed with all things Disney. This would be perfect for her Christmas present!